Burning coal produces a variety of residue collectively known as coal ash. It is one of the largest types of waste generated by American industry. It can be recycled into products like concrete or wall board, but these industries can’t absorb all the coal ash power plants produce. For the past half century, the state of the art coal ash management has been to store it in ponds. 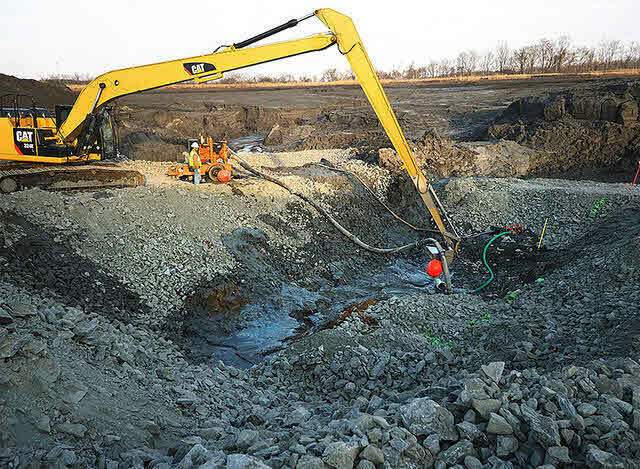 Major spills of coal ash in Kingston, Tennessee and Eden, North Carolina have demonstrated the hazards of this method. And upon further investigation, all coal ash ponds leak even when all else appears stable. Coal ash, like ordinary dirt, includes heavy metals and radioactive materials, but at much larger concentrations. It is not a hazardous waste. Products made from recycled coal ash come as close to perfectly safe as humanly possible. It becomes a hazard only when stockpiled and concentrated in one place—which is what happens to most of it. Scientists at the Center for Composite Materials Research at North Carolina A&T State University have found a way to encapsulate coal ash in polyurethane. In that form it can be either made building materials like siding or interior molding or into large blocks for storage. By entrapping pollutants like heavy metals in polyurethane, the process makes building new landfills unnecessary. The blocks can be safely stored above ground. At any time in the future, they can be ground to a powder and made into new products. The same team had already invented a material they called Eco-Core, about 95% coal ash, in 2003. It is very strong, non-toxic, heat resistant, and has other amazing properties. And in 2014, when Duke Energy’s coal ash pond in Eden ruptured, the company had never heard of this research. Scientists at world-class universities like Harvard or Princeton have relatively little trouble moving their innovations to market. Scientists at hundreds of lesser-known universities like North Carolina A&T lack the expertise to manufacture and commercialize their discoveries. They lack marketing and public relations skills. And they lack the money to hire other companies to take on these functions. Readers with money to invest in emerging green technologies ought to investigate the universities within about a hundred miles of their offices. They will likely find solutions to multiple environmental problems that primarily lack the funding to scale them up for practical use. David Guion writes the blog Sustaining Our World and has written three environmental Kindle books. You can follow him on Twitter or Google+. Photo credit: Some rights reserved by NC Dept. of Energy and Natural Resources.